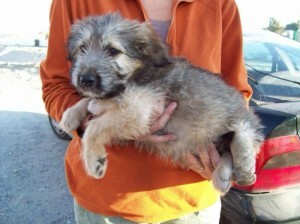 I am just one reason why you should help PUPPY RESCUE IN SPAIN today! In June 2011 an English couple called Bob & Tina Deeley, who were on holiday in a small village in Spain, went to put their rubbish in the bin. That’s when they saw me and two other puppies scavenging around the bins. 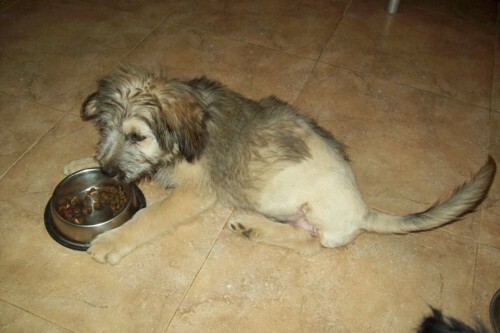 This is me just after I was rescued – I think I was about 3 months old. See my back leg is in a bandage! Apparently, the bottom half of my back left leg was missing and the wound it left had gone bad – it probably didn’t help that I kept walking on it! I am not sure how I lost the bottom part of my leg all I know is it was very painful. Bob & Tina took me back to their holiday home but because they were about to return to England they asked PUPPY RESCUE IN SPAIN if they could look after us. My two pals soon found new homes but I had to be mended before I went anywhere! 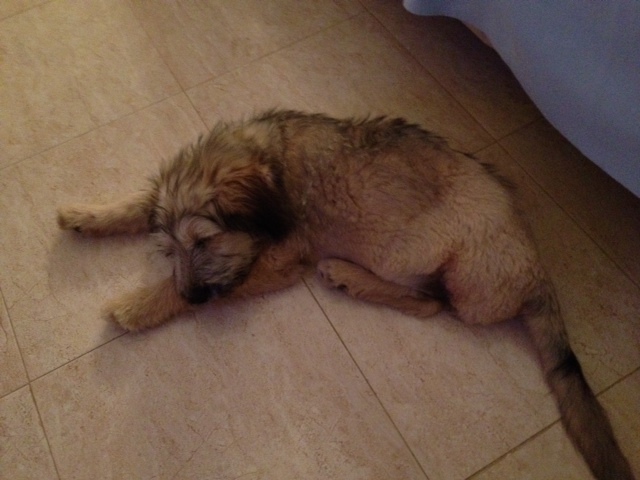 A lovely lady called Diane from PUPPY RESCUE IN SPAIN took me in to her own home and looked after me. Because I hadn’t got the hang of walking on 3½ legs my bad leg never seemed to heal, even though it was bandaged. In the end the vet’s advice was to take the whole leg away – and that’s what happened! Lots of good people donated money so that I could have the operation and another special lady call Anja Schrijvers paid for my aftercare. I couldn’t believe how generous and caring people are. Pepé and Maika the local vets were very caring and kind too. After I had my operation I carried on living with my foster Mum, Diane, in Spain with lots of other puppies Diane was fostering at the time. 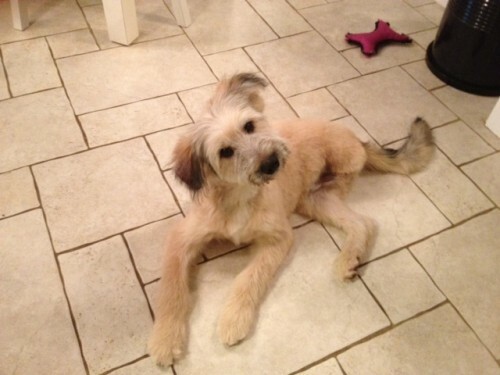 This is me after my operation – see my back leg has gone now! Now, Keith & Jan came out to Spain for their holiday and offered to foster me for two weeks so I could get some one-to-one TLC. It was great, me and Keith & Jan and a whole lot of attention and love – it was great, I almost forgot I had just had my leg taken off! It was now August 2011 – I was wondering what was going to happen to me when Keith & Jan went back to England! This is me when I stayed with Keith & Jan for 2 weeks just after my operation – I enjoyed some serious TLC! Well, do you know, they thought I was lovely and cute and cuddly, they only wanted to take me back to England with them!! Wow, how about that then – I couldn’t believe it! I had to live with my foster Mum for a few months while Keith & Jan sorted out my passport and stuff but eventually I made it to England in January 2012 – I must have been about 6 months old now. I had arrived at my forever home! I was so excited and ever so happy! I had landed on my feet – all three of them! 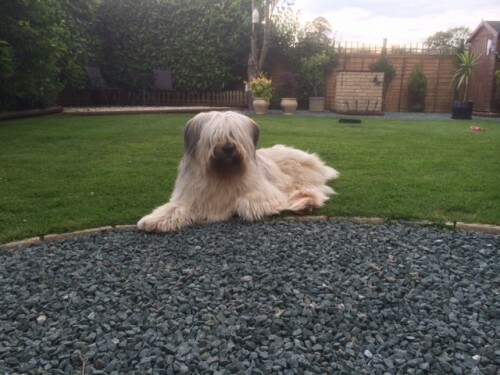 This is me just arrived in England in my new home – I am about 6 months old here! Last summer (2013) Keith & Jan took me back to Spain so I could meet again the people who cared for me, Diane my foster Mum, the volunteers on the PUPPY RESCUE IN SPAIN stall at the local Saturday market, Pepé and Maika from the vets (both remembered me), everybody said how handsome I was – I was really pleased I could go back and say thank you. 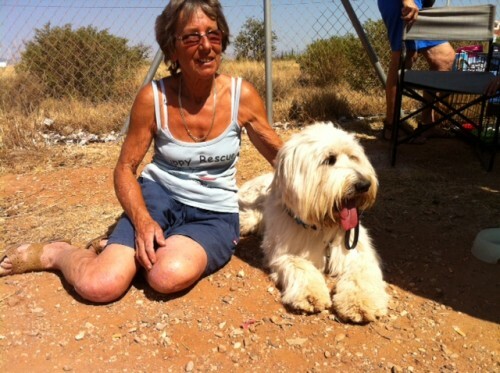 This is me with Diane from PUPPY RESCUE IN SPAIN. Diane looked after me before I came to England to live! I turned 3 years old just a couple of weeks ago. I have been very lucky to have ended up in a lovely home with my adopted brothers and sisters. I even have a couple of cats I can lick to death! None of this would have happened if it wasn’t for PUPPY RESCUE IN SPAIN and I owe them the lovely life that I now have. 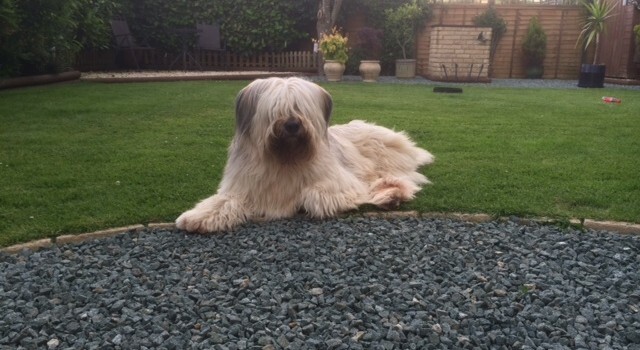 This is me in Spring’14 just before I had my Summer haircut! I want to do what I can to say thank you and help other puppies that find themselves abandoned or in trouble. PUPPY RESCUE IN SPAIN is a registered charity in Spain and run by English people. Some of the puppies end up in Holland or Germany. Some make it to the UK and others are re-homed in Spain. It all takes a lot of hard work from the volunteers and a whole lot of money! I owe a lot to PUPPY RESCUE IN SPAIN and I do what I can to raise some money so other puppies can, hopefully, be as lucky as I have been and end up in a lovely home. Why not be my friend and join me on Facebook, search for me using pudsey.albrow, that way we can keep in touch and share stories!